Flash is a hero in the DC comics universe who has the ability to move, react, regenerate and think at extremely high speeds. DC has a separate universe for its films and television so they will use a different actor for each world. Grant Gustin plays Barry Allen the Flash in the television series the Flash. 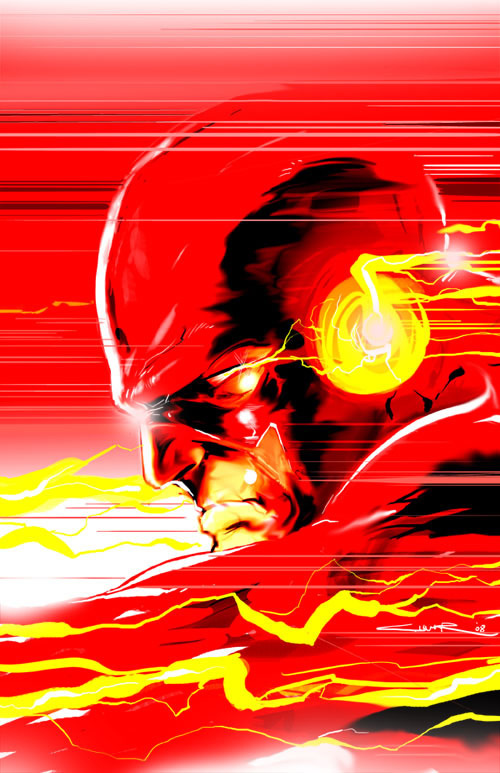 4 men in DC comics have used the name of Flash, Barry Allen, Bart Allen, Wally West, and Jay Garrick. Barry Allen is a forensic scientist known for being exacting and methodical in his work, which often makes him seem slow. He is often late to meetings and engagements which greatly frustrates his coworkers and even his fiance, Iris West. Working very late one night in his lab Barry is caught in a accident. A bolt of lighting struck his lab, spilling chemicals all over Barry. Barry learns that he can move at supers peed, has super fast reflexes, heightened regeneration and can think at a super rate. He creates a red suit that allows him to withstand the friction of the air and becomes a crime fighter and eventually joins the Justice League to protect the world. Super Thinking - Includes both thinking thoughts quickly and also at times fast learning. In some iterations knowledge gained through super speed reading is temporary. Quantom Tunneling- By vibrating at a fast rate the Flash can pass through solid objects. Telepathic Immunity - The ability to process thoughts at super rate makes speedsters like the Flash hard to control or effect through telepathy.